The Scrap Metal Market Report in May 2018 shows scrap steel prices remain at multi year highs though growth has slowed compared to past few months. While the scrap metal market did not show the same growth we saw in last months report, reported prices are still quite a bit healthier than this time a year ago. In fact, looking at the last six months the market average is up over 30% higher than the end of 2017. While encouraging, in this past month the price per ton for crushed auto bodies increased just marginally over 1.5%. The national average price for scrap steel from recycled cars is now over $215. Year-over-year our May index is up over 14% from this time last year and at its highest since October 2014. Taking a look back at last years scrap metal market report in May the year-over-year growth then was almost 32%. This really shows how far the scrap metal market has come at this point in 2018 after some pretty lean years. 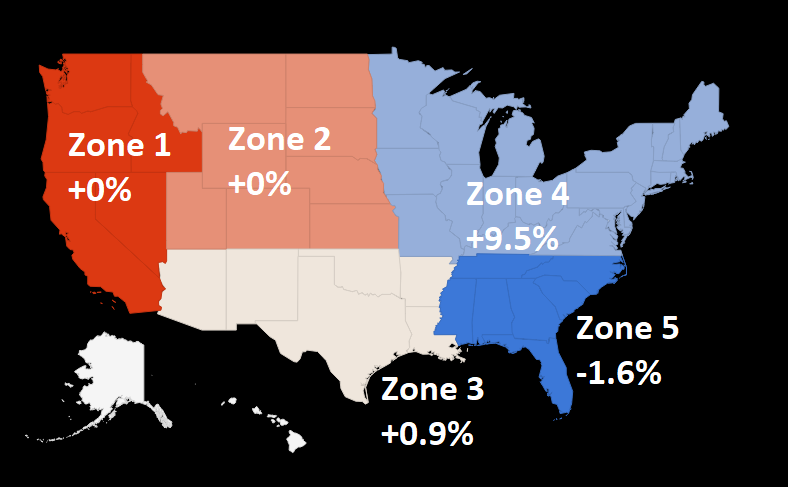 Across the country there was actually very little price change in four out of five zones. The only zone with significant growth was Zone 4 (northeast), which rose by over 9.5%. The only zone that was not either flat or had growth of any kind was zone 5 (southeast) which fell a modest 1.6%. U.S-China Trade Feud thought to be put on hold, heating up again – is there an effect on the steel market? While it seemed for a short while the trade feud with China was put on hold it is being reported today there is a June 15th deadline for specifying up to $50 billion worth of Chinese goods to be subjected to a 25% tariff. 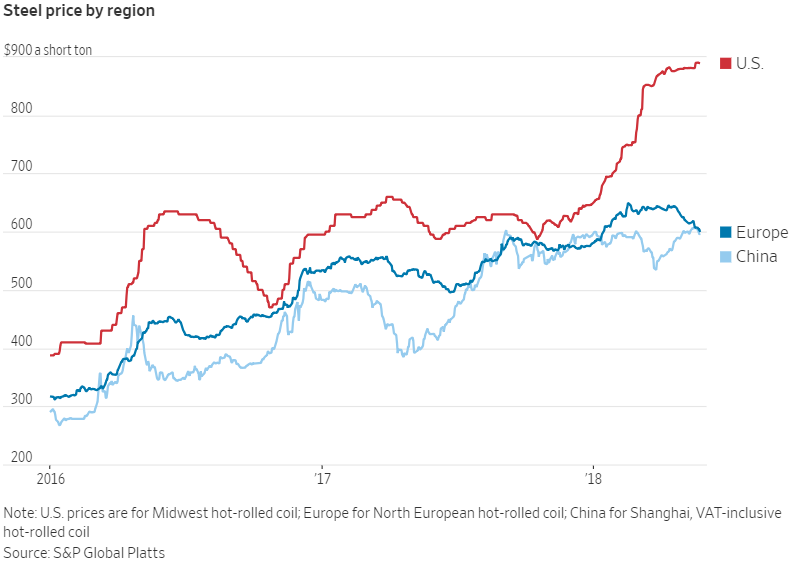 Much of this confusion surrounding potential tariffs has helped U.S. steel prices break away from its Asian and European counterparts. Specifically, there is a June 1st deadline for countries to negotiate deals to gain exemption from U.S. steel tariffs. From the Wall Street Journal this is a surge of nearly 40% this year. For manufacturers and consumers, they are likely to get squeezed by these higher prices. We will see in a couple days if any further details are set in stone that will provide more perspective on the global steel market and in turns its trickle down effect on the scrap metal market. Announced on Thursday, May 31st there will be tariffs imposed on steel and aluminum imports from Canada, Mexico and the European Union. Both Canada and the European Union are expected to retaliate with import tariffs against the U.S. 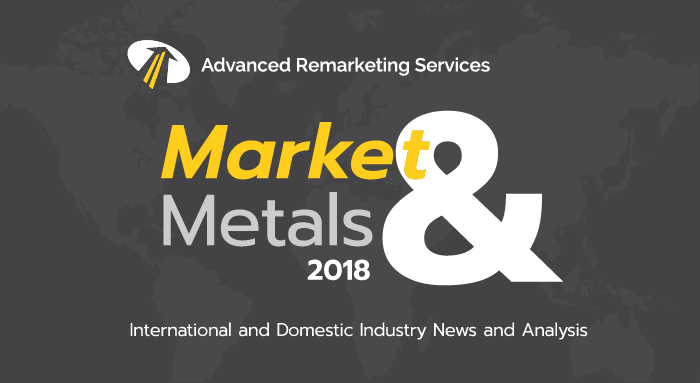 The steel and aluminum tariffs have drawn heat from our closet allies with Canadian Prime Minister Justin Trudeau calling the levies, “totally unacceptable” and European Commission President Jean-Claude Juncker saying “this is protectionism, pure and simple.” Both, along with Mexicio are expected to target a number of U.S. goods including steel in response. The tariffs go into effect Friday, June 1st.